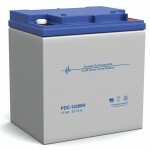 Description: Construction of a battery pack to extend the APC BR1500GI UPS operational time. This is an improvement that extends the operational time of the BR1500GI APC UPS. It can also be applied to other series of APC UPS devices. The particular UPS is a line interactive UPS with exceptional characterisitics. More about the types of the UPS can be found here. At the rear side it has a connector for external battery extending the operational time. Info: When adding extra batteries to a UPS, the maximum permissible load is not increased. 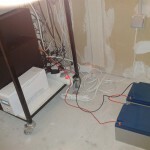 The maximum load is fixed and depends on the capabilities of the inverter installed into the UPS device. The benefit is that under the same load, the time to keep alive the devices connected to it, is longer. 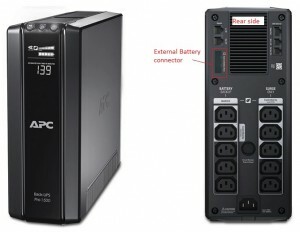 APC manufactures the BR24BP which is a battery pack and is conncted directly to the UPS. The thought was to construct a battery pack with higher capacity and -probably- with lower cost. Searching the web, valuable information was found into the site http://www.yourwarrantyisvoid.com/2009/10/27/breaking-into-apcs-br24bp-battery-pack/ explaining clearly how the BR24BP battery pack is constructed and -the most important- wired. As it is shown in the pictures, the pack constists of 4 batteries in two pairs; each pair is connected in series supplying 24 Volts and the two pairs are connected in parallel to double the capacity. 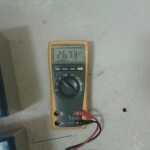 The type of the batteries is HR-1234 W meaning that they are 12 V, 9 Ah. With the above configuration the pack is a battery 24 V, 18 Ah. Info: when connecting batteries in series the voltages are added (2×12=24 V) but the capacity remains the same. On the other hand, when they are connected in parallel, the voltage remains the same (12 V) but the capacities are added (2×9=18 Ah). Also, the termination of the connector was presented. It was decided to build a battery pack with capacity of 24 Ah which is larger than the official. 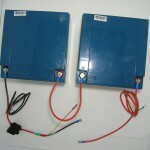 For this purpose two batteries with voltage 12 V and capacity 26 Ah were acquired and paired in series. It must be noticed that the batteries are not connected directly to the UPS with plain cable. As you can see in the relevant photo, the negative wire has a car-type fuse socket. Always must be used a fuse! In our case the fuse is 10 A. That means the maximum permissible power by the battery pack is approximately 10×24=240 W which is much larger than the connected loads which make a total of 100 W.
2 batteries 12 v 26 Ah. The type is Sealed Lead Acid (SLA) battery. fuse. It can be car-type or glass type. 1 resistor 20 Ohm, 1% accuracy. heat shrinking tube of various dimensions. Results: The UPS cooperates with the battery pack perfectly. The above times are real times and not estimated by the UPS. Voltage at the end of the battery pack. The cables used must have cross section suitable for the load to be supplied. Care must be taken because if the electric current is high, the cables will be warmed up because of electric losses due to the electric resistance of copper. As a result, a fire may explode! So be extremely careful. The cable and the relevant fuse must be selected according to the electric load. It’ s not suggested to construct a battery pack instead of buying the official one. On the contrary. The BR24BP battery pack is manufactured especially for the particular UPS and APC guarantees the perfect operation of it. The project was conducted for experimental purposes only. This entry was posted in Constructions. Bookmark the permalink.